The Chosen One: Data Analysis - Asian Universities? This bar graph aims to show that Asia’s universities are “gaining ground on their Western counterparts”, by plotting out the number of universities in each Asian country that are in the Top 100 in Asia. The representation here is clear, with Japan having 22 universities in the top 100, while Malaysia only takes up one slot in the list. However, the graph does not adequately prove what the article tries to say. First, there is no comparison with the universities in the Western world. Even though Japan may have 22 universities out of the top 100 in Asia, it does not necessarily mean that Japan fares well on the international level. Without the comparison to the universities in Western countries, readers cannot decide whether the statements in the article are true or not. Second, there is no trend line of the changes in numbers. 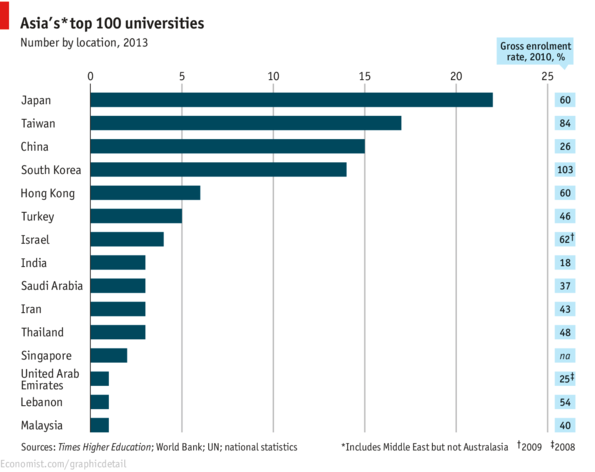 If the article tries to prove that Asia’s universities are “gaining ground”, then the graph needs to show a continuously increasing number of Asian universities in the top international lists. However, some information presented on the bar graph can be interesting to address. First, the visual can show a comparison between the population size or land area and the number of top universities a country has, and study if there is a correlation between having a larger population and having a greater number of top universities. If there is no correlation there, then what should countries try to do in order to get better educational institutes? Second, there can also be an exploration of the correlation between the number of top universities in the country and the enrolment rates in these universities. Although the graph does present the gross enrolment rate in each of these countries, is there any link between this and the number of top universities that a country has? Or is it that the population figure affects enrolment rates? These are the questions that can be asked by readers, and the graph should answer them. In general, given that education is such a complex system, and there can be multiple factors that affect its proficiency, more facts need to be given for the reader to understand what allows Japan to have such a great number of top universities, and how proficient the Asian universities are in comparison to their Western counterparts. This means that the simplistic bar graph will not be sufficient in proving the point of the article, and the information can be represented in other ways to allow readers to understand the issue better.